Until recently, one of the barriers of using the 3D printing technology is the ability to print large products. 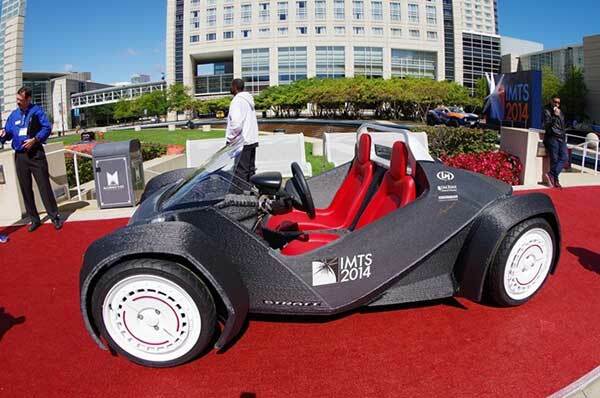 During the last International Manufacturing Technology Show (IMTS), Local Motors presented the world’s first 3D printed car. The new 3d printed car, Strati, takes the 3D printing industry to a revolutionary route as it opens the doors to easily 3D print large products with maintaining sustainability through the implementation of different technologies from additive to nano manufacturing (check What Are the Types of 3D Printing Technologies?). The 3D printed car is printed in one piece in 44 hours using the direct digital manufacturing (DDM) which is the first time to use this technology to create make a workable car. The other parts of Strati were sourced from multiple suppliers including Renault. The below video shows the 3D printed vehicle, Strati, during the printing process. The car was later assembled during the International Manufacturing Technology Show earlier this month September 2014. The 3D printed car design was selected from more than 200 concepts for the designer Michele Anoé from Italy. The design was primarily selected because its suitability to be printed and how it fits in the production process of the car. At this point, Strati is on the prototype stage and going to be enhanced with the time. 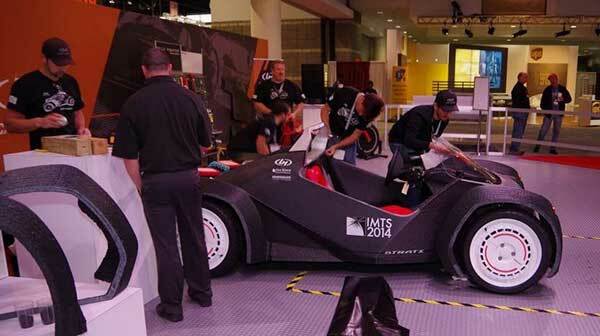 Strati 3D printed car in IMTS Show. The 3D printed vehicle was created from only 49 parts including the body itself. The 3D printed material used in the car is carbon fibers informed thermoplastic or ABS (What are the Types of 3D Printing Materials?). Strati can move with the speed 40 mph and a total distance of 120 miles with dingle charge. 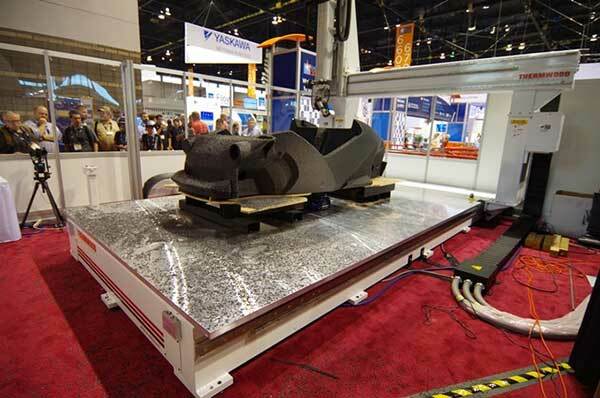 “The BAAM (Big Area Additive Manufacturing) machine can be used for actual production. The deposition rate of 40 pounds per hour of carbon reinforced ABS plastic and the large size mean that large parts, like a car, can be produced using additive technology,” said Andrew Jamison, CEO of Cincinnati Incorporated. Check these 5 Affordable 3D Printers to Buy. While the current cost for the car is as high as a sedan car, it is unfair to judge the price at this prototype stage especially when the Local Motors is still developing the product to be a customized car the consumers can modify to fit their needs.